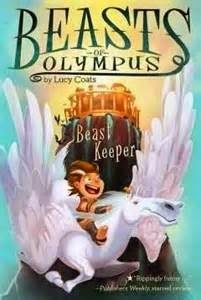 Beast Keeper (Beasts of Olympus #1), by Lucy Coats, with many illustrations by Brett Bean (Grosset & Dunlap, Jan. 2015) is the story of how an ordinary boy in ancient Greece gets whisked up to Olympus to look after the menagerie of mythological creatures that are kept there (to be sent down to earth as required for hero-proving purposes). 10-year-old Demon (short for Pandemonium) is only normal for a certain value of normal--his dad's Pan, god of wild creatures. And so Demon has a preternatural knack for monster-whispering, that comes in handy when confronted with the wild and wacky beasts of Olympus....but it's not the poo (though there's plenty of it) or even the terrible wounds inflicted by Hercules on his charges, that makes Demon anxious--instead it's that nasty sense that he's only a whisker away from provoking immortal wrath (the Greek Gods and Goddess being the sort of divinities they are). But it all ends well, and there are more books to come (Hound of Hades is also out now, and Steeds of the Gods comes in May). Beast Keeper is a perfectly reasonable book to have on the shelves of a second grade class library. It will probably become dog-eared. It's sequels will be asked for. 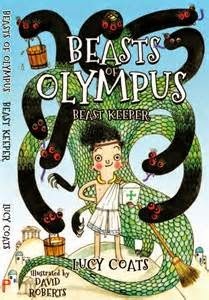 It's a premise with lots of kid appeal (what a dream come true for the animal lover to look after mythological creatures!) and for some of those kids, the poo references will add to the fun. There's no particular reason why anyone who's left elementary school should read it (it doesn't offer anything especially original or beautifully enchanting), but not every book needs to reach beyond its target audience.